Beau Riddle reacted to winning the final round of “body bingo” in Breanna Juliette’s fourth-grade class at St. Joachim School on Jan. 24. The game helped the students to memorize parts of the human body. Similar to other Catholic schools in the Archdiocese of St. Louis, St. Joachim School in Old Mines celebrated Catholic Schools Week in the most Catholic way: with a Mass, of course. 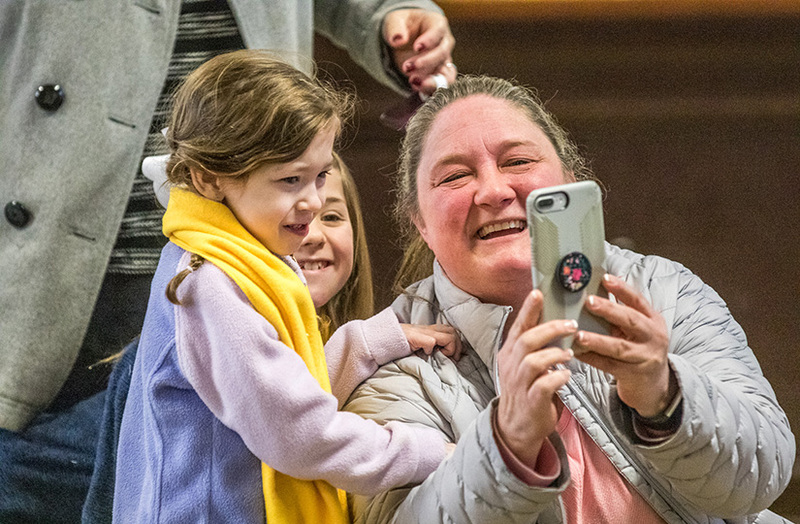 Sharon Christopher took a selfie with her grandaughter Raelynn Ronchetto, left, and Raelynn’s cousin Kenzi Funk Jan. 29 at St. Joachim School in Old Mines. and apostolic Church, as Father Jim Hansen noted in the homily to St. Joachim students at Mass on Jan. 29. St. Joachim’s Catholic Schools Week celebration includes a lot of newcomers: 11 in first grade and nine in kindergarten, which is almost half of the school’s K-8 enrollment of 50. Though that’s only 10 percent of the school’s heyday almost 60 years ago, when the area’s tiff mines were in full swing, 20 students in the lower grades bode well for the future. A graduate of St. Joachim, Portell started her teaching career at her alma mater (with future principal Carmen Litton as a student) then came out of retirement from public school this year when her former student came calling. “She said, ‘I need a teacher,’ and I said, ‘OK!’” Portell said. Likewise, Litton also started teaching at her alma mater and returned six years ago as principal after retiring from public education. Once the largest Catholic school in the area, St. Joachim is now the only one in Washington County. The nearest Catholic elementary school is 17 miles away at St. Rose of Lima Parish in De Soto; no other is closer than 24 miles. The three-story school building opened in 1949, with the parish starting a high school the next year and operating it until the 1970s. The peak enrollment was about 500 around 1960, with more than 100 in high school and a little less than 400 in grade school. The high school took up eight rooms on the top floor, while the grade school crammed into eight rooms on the first floor. The 70-year-old school building looks good for its age, with new windows for the cafeteria (just last week), new security doors, new flooring and restored lifting fixtures (with help from the Knights of Columbus). And with robotics, laptops and smartboards, St. Joachim is providing a 21st-century education as students demonstrated on Jan. 29, which was Grandparents Day. After Mass in the 1828-vintage church and fellowship in the school cafeteria, grandparents checked out the students’ math and science fair projects and were treated to a performance of the school song to patron St. Joachim, who was the father of the Blessed Mother. Then, students demonstrated their Lego Mindstorm robots in the classroom for sixth- through-eighth-graders. Sixth-grader Clara Villmer gave robotics (new this year) and Catholic education in general the thumbs up. So did classmate Emily Hahn and eighth-grader Dane Dickinson, who recently represented the school and parish at the March for Life in Washington, D.C.
Emily carried a poignant poster in the procession before Mass. It read: “Dynamic Teaching is what matters.” She answered in the affirmative when asked whether she has received “dynamic teaching” in her years at St. Joachim. When St. Joachim High School opened in 1950, it was among 13 parish secondary schools in the Arhcdiocese of St. Louis. Eight remained after it closed in 1971, but three had closed their doors by 1975. Only two remain: Valle Catholic of Ste Genevieve Parish; and St. Vincent of namesake St. Vincent de Paul Parish, Perryville.